The Dalai Lama said the country's rich knowledge of truth and philosophy was distinct from that of the world. The Dalai Lama was addressing a gathering of students at the Somaiya School in Mumbai. 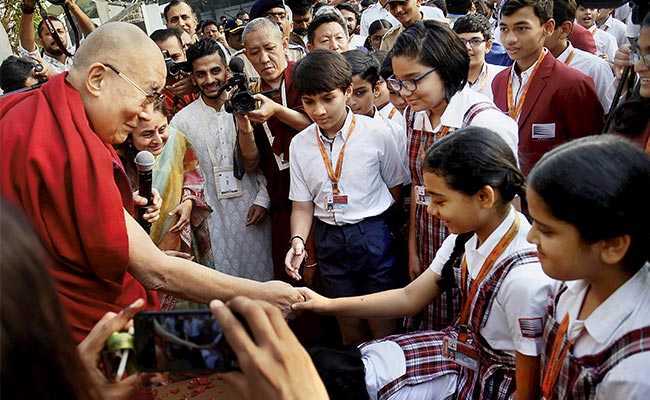 Mumbai: Tibetan spiritual leader the Dalai Lama today said the younger generation of India needs to focus and learn more about the ancient knowledge of the country in order to move forward. "External things - modern science, modern education (is) wonderful, very useful. But as far as the inner world is concerned, modern education, modern knowledge I think still is very primitive. India's future can do a lot of contribution, regarding promotion of knowledge of inner world and with that, inner peace," the Dalai lama said. The Dalai Lama also said his life has been full of struggles but he realised the only way to overcome the difficulties was by being mentally strong. "My whole life has been quite difficult. Lot of problems, but I realised training of our mind is very helpful. It helps in keeping things clear and achieve peace of mind. Peace of mind is very important, even for physical health," he said. The Dalai Lama further said the country's rich knowledge of truth and philosophy was distinct from that of the world. "You are the younger generation of this great nation. Why I used great nation? Of course it's a democratic country and economy, but when I say great nation I mean it over 3,000 years" he said. "While the rest of the world still remained dark, ignorant, this country over 3,000 years was trying to find out the reality, deeper meanings of truth," he signed off.